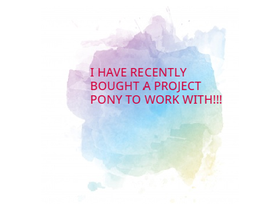 I have a just invested in My first project pony! I am a horsey girl and hope one day to become a specialist equine veterinarian. If you are horsey too, send me a message! NO junk messages or studios! At the moment I am training my beautiful 5 year old Buckskin Dartmoor x Quarter pony gelding up. He is green broken. What would he be eligible to be registered? Q Pony, Dartmoor and dilite. What else? Anyone Who Has Horse Projects Put Them Here!! !